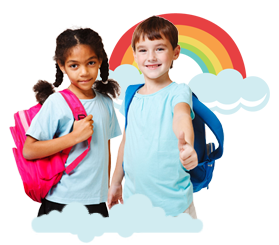 Sunshine Kindergarten is committed to providing the best education amidst a positive and inviting learning atmosphere. Our school was designed and built for the sole purpose of providing an atmosphere whereby children are free to explore, create and learn many new and exciting things. It is our steadfast desire that children build strong communication skills that will allow them to express themselves confidently, in a manner that conveys their own thoughts, opinions, needs and desires in a clear and articulate fashion. Each morning, a carefully designed list of new vocabulary words are introduced and taught within context. Our Literacy and Phonics component is aimed at teaching children the 42 sounds in the English language. Armed with these skills they will move to blending sounds within words, which lend to reading simple sentences in age-appropriate literature. The sounds are infused in a memorable way by means of songs, dance, art and the introduction to a world of fictional characters that will move the children to love and appreciate their new ability to read and write. The overall social component in our curriculum whereby each child will come face to face with social issues, within the family and amongst peers and adults in and out of the classroom. These new life skills will shape their moral and ethical perception right into adulthood. Our young learners are encouraged to embrace the diversity in cultures, beliefs and ideas, making our school a true global community. The children are encouraged to treat all those around them with honesty and integrity, never forgetting to show others the same courtesy and respect with they would like to be treated. In short, these students will become positive, productive and contributing members of society. Our curriculum, classrooms and playgrounds were carefully designed to provide an environment where the inquisitive nature of children can be further stimulated with vibrant aesthetic designs and a truly hands-on approach to the beauty that surrounds our school. We are keen to explore the interests of all the children and assist them in acquiring the skills needed to learn and explore new and wonderful things. It was once said that with self discipline, all things are possible. Without it, even the simplest goal can seem like the impossible dream. It is our hope and desire that all the children here at Sunshine Kindergarten grow up to succeed and achieve whatever they set their minds to and follow that dream. In preparation, we help to build a solid foundation of self-confidence and a strong sense of pride in the work they produce. Doing so will build in them the work ethic and desire to reach for higher goals, accept challenges that truly stimulate the mind and heart and above all, be the best person they can be. Our young learners will exhibit critical and analytical thinking skills by demonstrating the ability to find answers for themselves. They are taught to be self-reliant to strive to answer the question “why?” based on previous knowledge gained in and out of the classroom. Children will learn the needed skills to absorb and apply the abstract concepts found in Mathematics and Science doing so in memorable ways through puzzles, games and songs. We are thrilled to observe day after day that our students are able to present their ability to take information, process it, and draw their own conclusions.